Thank you for your interest in volunteering with The Lyric Theatre. 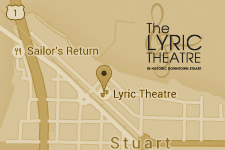 As a non-profit organization, The Lyric Theatre relies heavily on the valuable assistance of our volunteers, who generously give their time and act as ambassadors of The Lyric to help us to provide quality entertainment at an affordable price. Our volunteer staff are a treasured component of The Lyric team and are vital to our success. Volunteer Ushers - We have a dedicated group of ushers who give their time and energy to our patrons enabling them to have an enjoyable Theatre experience. Our ushers must assist patrons with seating, distribute programs and provide assistance to patrons during daytime and/or evening performances. All ushers must be able to work throughout the theatre comfortably. This includes being able to climb stairs. As one of the responsibilities of the ushers is to assist with the evacuation of the building in the event of an emergency, this is not a good position for anyone with physical limitations. Each of our ushers MUST …. Volunteer Bartenders - Our volunteer bartender duties require setting up the bar and serving beverages to patrons prior to performances and during intermission. Accept cash from Patrons and make change. Beverages served include beer, wine, limited mixed drinks soft drinks and water. There is carrying involved. This is not a good position for anyone with physical limitations. Each of our bartenders MUST ….